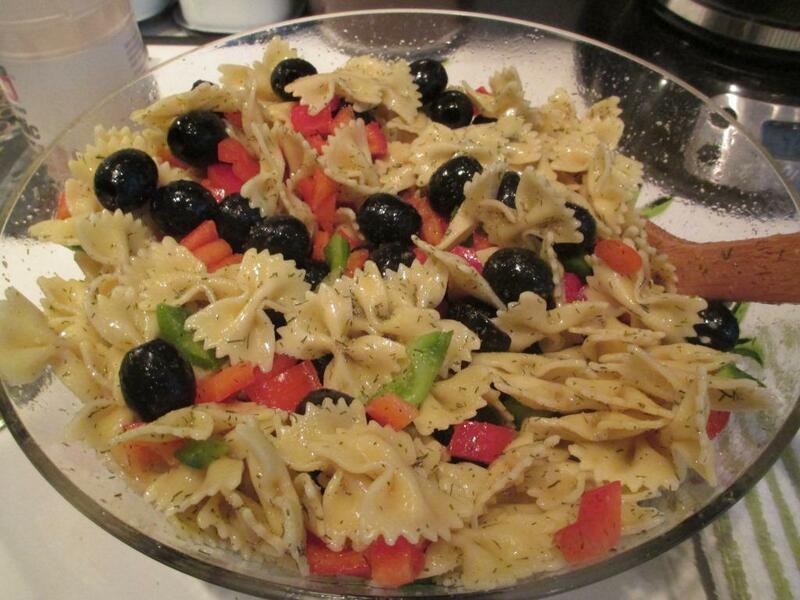 For years I’ve been making this simple, quick, and inexpensive pasta salad that’s sure to please just about everyone because anything can be done with this base. Literally, anything. You can throw in any type of meat—shrimp, chicken, even steak will work—or do it with any kind of vegetable (which is awesome, because if you load it up with enough veggies and other non-animal crap it makes a great throw-it-on-the-table as the main course for the vegetarians in your universe). Just make sure whichever spice you choose works well with the ingredients you’re going to add. Here’s how to make the base. Boil water and cook pasta; check frequently until it is cooked al dente. When pasta is al dente, drain into colander and immediately rinse with cold water. This stops the pasta from cooking, “freezing” it in its harder state. Drain thoroughly. I usually let it sit in the colander for about ten minutes. Pour pasta into large mixing bowl. Add about ½ cup of olive oil and stir thoroughly. The pasta should be coated, but you don’t want to end up with a gallon of it at the bottom of the bowl. Use your judgment. If you think you need a bit more, or you prefer a bit more, go for it. That’s it. From this point, add your spices of choice and your vegetables and/or (cooked) meats. Just mix it all together so that everything is evenly distributed. I usually put the spices in first, then add the solids, then test it to see if I need more spices, but either way you do it will work. Here are some combos I’ve done in the past (they have stupid names because I made them for specifically themed parties so that’s how I remember them). If you invent your own (and I encourage you to!) drop me a line and share it in the comments! Cubed steak (any kind, though I find the higher the quality the nicer it is)—cooked the way you prefer. Do not do this raw. Your guests will probably not eat it. Dill or Oregano (I’ve done both; they both work). Posted on July 3, 2014, in Deep Thoughts & Fun Stuff and tagged cook-out side dishes, easy recipes, inexpensive dinners, July 4 recipe ideas, pasta salad recipes, vegetarian pasta salads. Bookmark the permalink. Leave a comment.